From 23-27 September 2019 EU Gateway | Business Avenues will choose up to 50 companies to participate in a mission focused on Environment & Water Technologies. This five-day mission week will provide the opportunity for participants to showcase technologies and products to a targeted audience of potential business partners during two exhibition days. Our teams will search for local business partners, schedule individual meetings, and promote EU companies in Korea to gain visibility, all prior to the business mission. 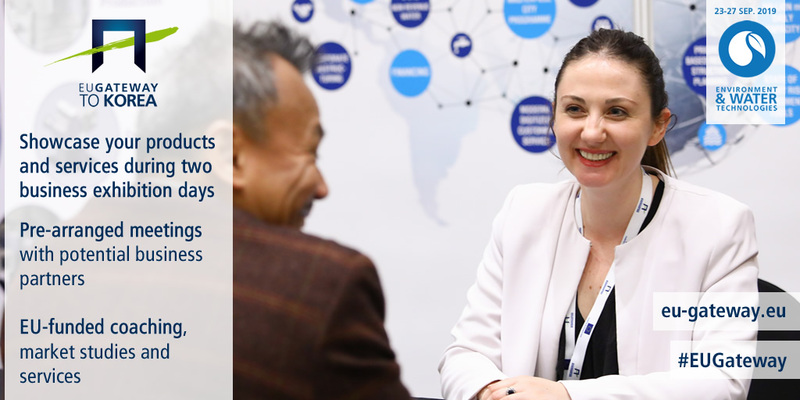 Selected companies can also request additional services such as translation into Korean of company documentation, and personal interpreters for business meetings held outside the exhibition days. Companies interested in this opportunity can apply online until 10 May 2019.